When we started sketching out our trip, we planned to stay in a small boutique hotel in the Old Quarter. Then Hanna received an invitation from the administrator of the International School to stay at the family’s villa in exchange for taking care of their cat. This was a huge blessing. Not only would we save the expenditure for two hotel rooms, we would not have to check in and out for our trip to Mai Chau, be away from the hustle and bustle of the Old Quarter, have room to spread out and facilities for laundry and cooking, with the added bonus of a kitty to play with! The villa was located in an area known as Ciputra. 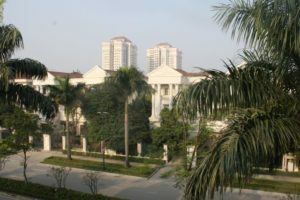 Many of the villas are occupied by executives of foreign companies. Most of the International School teachers live in apartment buildings nearby. The view from our villa. The apartment towers and an American market are an easy ten minute walk away. The villa had three floors. The ground floor consisted of a living room, kitchen, dining room and half bath. The second floor contained two master-style bedrooms, one of which was set up as a study. The third floor had an open living area, two bedrooms, a bathroom, a laundry room and a loft that was used as a play room. There were nice touches such as marble tile floors and a small swimming pool in the back yard. Dining room. Kitchen is to the left. The windows were boarded up due to an increase of burglaries in the area. There was no dishwasher. 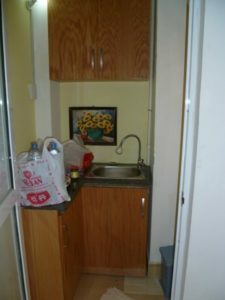 Instead, the cabinet over the sink had a slatted bottom to be used as a dish drainer. Upstairs bedroom with loft above. There seemed to be electrical switches for everything. Nighttime winter temperatures in Hanoi range from the high 40s to low 50s. Most homes do not have furnaces; residents rely on clothing layers and extra quilts instead. 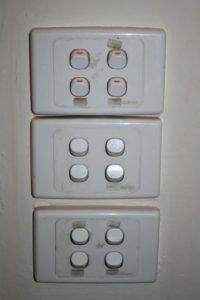 Our villa had the luxury of space heaters in the living room and master bedroom – more switches. Despite Vietnam’s humid climate, the majority of homes have only a washing machine. Clothing is hung out on porches to dry. This may take several days. Hanna’s clothes were often still damp when the house helper brought them back to her. We were again fortunate that our villa was equipped with a clothes dryer, but even a small load took nearly two hours on high to dry. Laundry drying at apartments near the university. 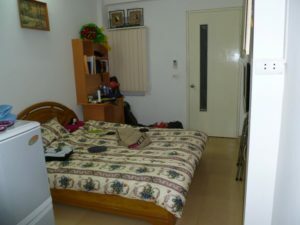 LCMS rented a room for Hanna in a home near Hanoi University of Science and Technology. Her landlords both spoke English very well; the husband had a government position and the wife worked at the Canadian Embassy. 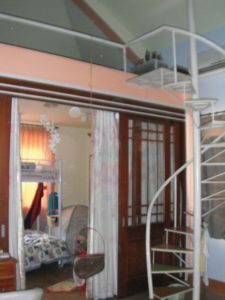 Hanna’s home in Hanoi. As a frame of reference, Hanna is 5’4″ tall. The home is less than 3 meters wide. Hanna’s landlords bought the property to live close to the wife’s parents, tearing down the existing structure to build this house. Located in an alley, the houses are extremely narrow, but tall. This house has five stories. Just behind the gate there is a utility room where they park their motorbikes and bicycles. Hanna’s room was the rear half of the first floor. It was about the size of a typical dormitory room in the United States. Hanna’s kitchenette. She had a mini fridge and a hot plate for food storage and preparation. 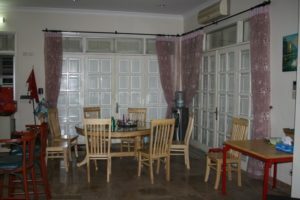 The second floor is the family’s living space with a living room, kitchen and dining room. The third floor has two bedrooms, one for the parents and another shared by their son and daughter. The fourth floor has a laundry room and a couple of rooms used for storage. The fifth floor is currently vacant. In a few years the children will want rooms of their own and one or both of them will move to an upstairs room. 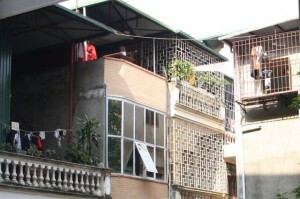 These are representative of the nicer residences in Hanoi. On the other end of the scale, some street vendors live in their storefronts. We also saw rudimentary rural huts that I will share in a future post about our side trip to Mai Chau. Joseph and the cat to whom we owe our stay at the villa. Thanks, Panini! 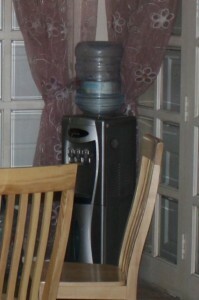 Water – It is not safe to drink the tap water in Vietnam, but bottled water is cheap and readily available. I have since learned that may not be entirely safe either, but none of us got sick drinking it. We used tap water to brush our teeth, and that turned out fine as well. Bottled water for cooking and drinking. We consumed two big bottles and innumerable small bottles during our stay. We learned the hard way how water is delivered to individual homes. 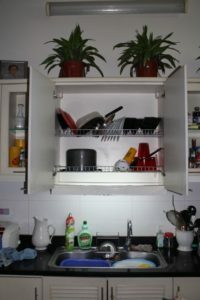 On Christmas Eve, our first night in Hanoi, we suddenly had no water. 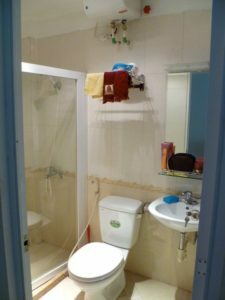 Back home that would be a major plumbing emergency with an equivalent service fee, but in Vietnam it just necessitated a call to the house helper to arrange for a plumber to drop by. Despite a significant language barrier, he managed to explain to us that water is pumped into a holding tank on the roof. One of the toilets had kept running and emptied the tank. In about an hour the tank would refill and we would have water again, but we would need to make sure that toilet stopped running. Problem solved. Sanitation – To conserve water, toilets are equipped with either two buttons or a two-way lever. One delivers a mini flush for liquid waste and the other a full flush for solid waste. Some public facilities are equipped with “squatty potties.” Although I was instructed on various methods for their use, I fortunately never had to use one. 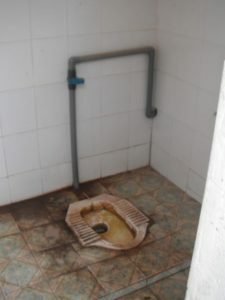 “Squatty potty” en route to Mai Chau. 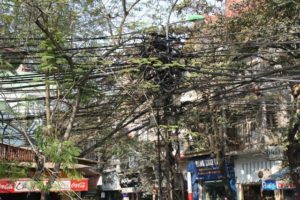 Electric – Wiring in Vietnam is a jumbled mess, with ugly tangles of cables everywhere. Phil surmised that when there is an outage it would be easier to cut a wire and start over than to find the problem, so there are multitudes of dead wires, some just dangling, as well as live ones. Once while we were walking through the city, Joseph inadvertently knocked the cover off a service box of some sort mounted to a utility pole. He started to pick it up to replace it, but Phil and I both quickly intervened. 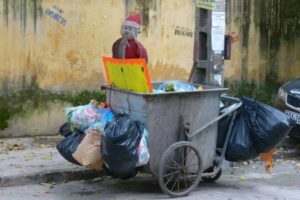 Trash – Hanoi is a dirty city. There are no streetside garbage cans; people just drop trash where they are. (Our “Leave No Trace” training would not allow us to do the same, so we kept our trash in our pockets or backpacks.) Streetsweepers run, but they can’t reach the refuse that accumulates on sidewalks. Household trash is put out on the curbs and collected in pushcarts. Trash pickup outside Hanna’s house after the holidays. Streets and Traffic – Traffic is as bad as you’ve heard – maybe worse. Traffic lights are few, and personal bubble space is nonexistent. Sometimes another vehicle would be merging toward ours so closely that we anticipated a collision, when suddenly a motorbike or two would zip in between. 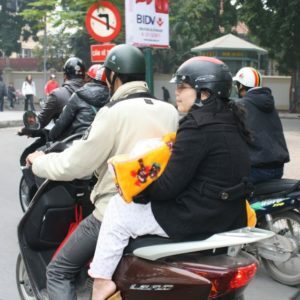 Amazingly, we saw just one accident during our week in Vietnam. It was not serious, as the volume of traffic keeps the speed low. Back in college, I preferred playing Frogger to Pac-Man, Who knew that years later those skills would come in handy crossing the street of Hanoi? Hanna was impressed by our fearlessness and taught us early on that motorbikes can avoid hitting you, but cars can’t. Inexpensive to buy and operate, motorbikes are the preferred mode of transportation. Whole families, including infants, will ride on a single motorbike. We often saw a precarious amount of cargo tied with twine to a motorbike. Automobiles are a sign of affluence. Bicycles are still common, and we saw a couple of horses and buggies. It startled us to see infants and children on motorbikes. Most adults wore helmets but most children did not. Hanna’s friend Aimee explained that many Vietnamese believe that children’s necks are not strong enough to support a helmet until age 12. Taxis are plentiful and inexpensive. There are small (4-passenger) and large (7-passenger) taxis and even larger buses for hire. Large taxis cost more, as do rides with English-speaking taxi drivers (Hanna would only use two companies). Still, we had only one fare over $10 and that was for a more than 20 minute ride with two stops. Hanna sometimes rode motorbike taxis when she was by herself, but usually took the bus. Her monthly bus pass fee was $4 for unlimited rides. Individual bus rides cost 15 cents (that is not a typo). We took the bus a couple of times for the experience. It is considered rude to speak loudly on the bus which makes for a much more pleasant experience than in the States. The sheer number of vehicles puts parking at a premium. 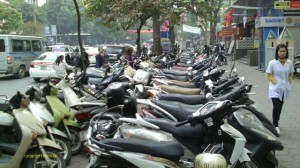 Parking lots are three or four deep bumper-to-bumper vehicles, and motorbikes are often parked en masse on the sidewalk. In fact, it was not unusual to see motorbikes driving on the sidewalk. Motorbikes parked on the sidewalk. Motorbikes aside, Hanoi sidewalks themselves are often in a sad state of repair. Uneven surfaces, cracks and potholes are common. It is quite a contrast from the ADA standards back home, but we also did not see a single person in a wheelchair during our visit. 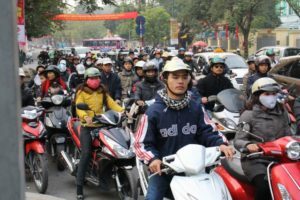 Air Quality – Industry, the massive number of motor vehicles, and lack of regulation contribute to extreme air pollution in Vietnam. Many residents wear a cloth filter over their nose and mouth, but I don’t know if they are effective. Hanna had a chronic cough while she lived in Vietnam. Phil and Laura also developed a cough during our visit. Joseph and I, who both take Singulair for allergies, did not. 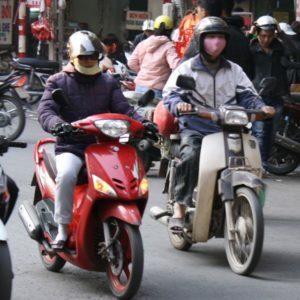 Motorbike riders wearing face masks. The subject I am most often asked about regarding our visit to Vietnam is food. 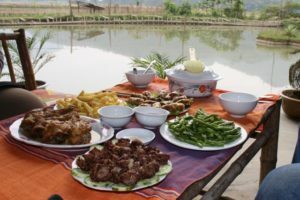 Vietnamese cuisine, based on fresh meats and seafood, vegetables and rice, is considered to be one of the healthiest diets in the world. Food is for the most part inexpensive, although some imports at American markets are pricey (as an example, we paid about $5 for a bottle of pancake syrup to leave as a thank-you for our host family). We enjoyed a variety of food, from a pot roast prepared by Hanna’s coworker and friend Sarah to hamburgers at Kangaroo Cafe (operated by an Australian expatriate) to traditional Vietnamese dishes and street food. Following are the highlights of our culinary experience. One other note – we saw a KFC in Hanoi, but there are mercifully no McDonald’s in Vietnam. Hanna and her landlords. The apple slices were served for dessert, along with pomegranate candy he brought back from a trip to China. 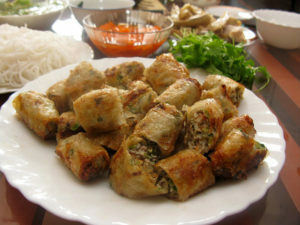 Chả giò, or spring rolls, consist of seasoned ground meat, mushrooms, and diced vegetables such as carrots, kohlrabi and jicama, rolled in rice paper and deep fried. We also made our own spring rolls from combinations of fresh ingredients and rice paper, eaten cold. Both varieties are delicious. 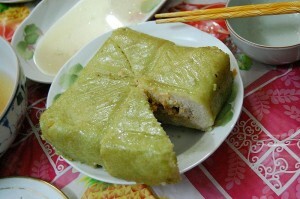 Bánh chưng, a traditional Vietnamese rice cake stuffed with mung bean, pork and other ingredients wrapped in bamboo leaves and boiled until the filling is cooked and the rice has absorbed the green color from the leaves. 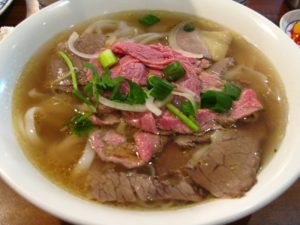 Phở (pronounced fuh) is a savory Vietnamese soup with meat, rice noodles and vegetables. The broth takes hours to prepare using beef or chicken bones, charred onion and ginger, cinnamon, star anise, cardamom, coriander seed, fennel seed, and clove. 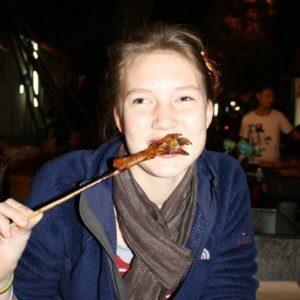 Street Food – Hanna had a food allowance of about $6 per day. She had only a mini fridge and a hot plate for food storage and preparation. Fortunately, there was plenty of affordable food from street vendors throughout Hanoi. These food stands would never in a million years pass inspection back in the States, and would appear and disappear randomly (or perhaps not). 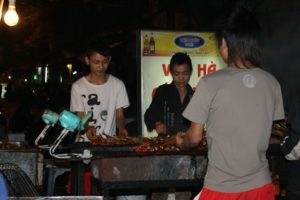 A typical street food vendor. We did not eat at this one. 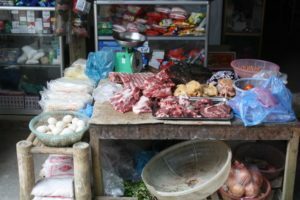 For breakfast Hanna usually bought a bowl of bánh cuốn from a stand near her house, at a cost of about 75 cents. 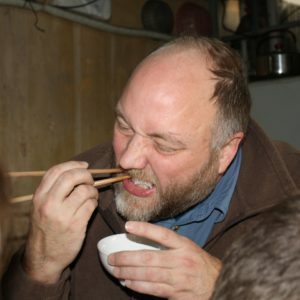 Phil enjoying bánh cuốn and demonstrating his newly acquired skill of eating with chopsticks. 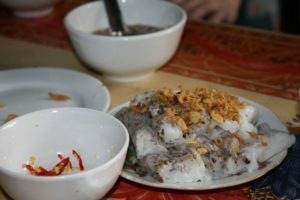 Bánh cuốn, a rice noodle roll typically eaten for breakfast. 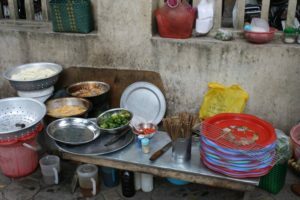 One evening the girls and I went to dinner with a group of Hanna’s expatriate friends at an area they called “Chicken Street.” The food was prepared at an open air grill. We shared different types of chicken skewers along with grilled vegetables and toasted sweet bread. Food prep on Chicken Street. Laura bravely ordered a grilled chicken foot. Not much meat. One of the remnants of French influence in Vietnam is a preponderance of bread stands. Phil and Joey were particularly fond of stopping for a snack. 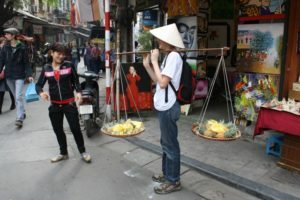 There are also fruit vendors. One of their favorite tricks is to invite tourists to hold their wares, then extort a photo op fee (it’s still less expensive than a party pic back in the States). Joseph the fruit vendor. The pineapple was delicious. 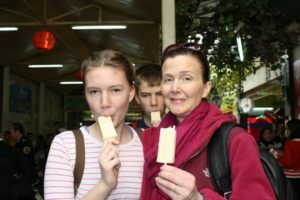 Ice Cream – Hanna took us to Tràng Tiền Ice Cream Shop, a well-known tourist stop in Hanoi. Enjoying our green bean and sticky rice ice cream. Mai Chau – I will dedicate a later post to a side trip to the Mai Chau district, but the food there was outstanding and deserves a mention here. It was served family-style and included soup, chicken, beef, seafood, spring rolls, rice and vegetables. Interestingly enough, French fries are served often in Vietnam. Breakfast was a choice of ramen noodles or eggs (either fried or “mixed,” which is sort of scrambled) with a baguette and a wedge of Laughing Cow cheese, also surprisingly popular in Vietnam. Markets – While we would have liked to, we did not have the opportunity to purchase and prepare foods from a market. In closing, I would like to share photos that I snapped at a couple of markets that we passed. Chickens at a small market near Hanna’s house. 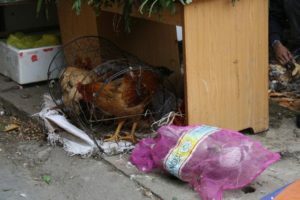 Wow, I did not notice the birds in the potato sack until just now when I posted the picture. A little more than a year ago, if you were to ask someone in our family where s/he would most like to visit, you would get responses ranging from Ireland to Germany to Australia. Vietnam would not have be mentioned. So how in the world did we end up visiting there? 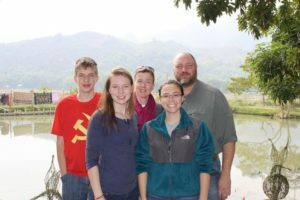 In 2010, during a gap year between university and graduate school, Hanna applied with Lutheran Church Missouri Synod World Missions, requesting placement in a country where she had not already traveled. 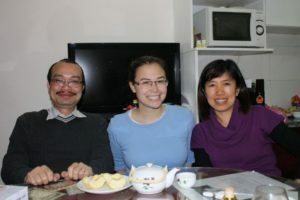 She was offered a position as a volunteer English teacher at Hanoi University of Science and Technology. She originally volunteered to serve for two semesters beginning in January 2011, with a summer at home in between. 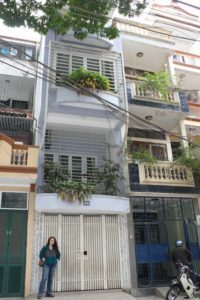 During that summer break, Hanna decided to extend her stay in Vietnam through a third semester. The schedule of the Vietnamese educational system meant that Hanna would not be able to come home for the Christmas and New Year holidays. After putting her back on a plane in September, we started looking into making a visit to Vietnam. It turned out that three months was not too far ahead to be planning a trip to the Far East. Because we knew absolutely nothing about flying to Asia, we opted to work with a travel agent, who was able to find us significantly less expensive flights than I had found on the internet. 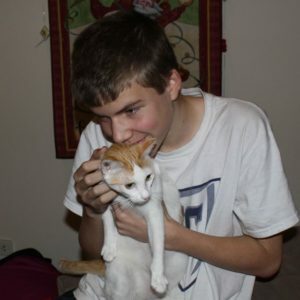 The International School administrator offered Hanna the use of his family’s townhouse in exchange for watching their cat while they traveled to the United States for the holidays. Phil requested time off work; Laura arranged to take two of her finals early and asked to be excused from basketball practice over the school break. Bosses, teachers and coaches were uniformly cooperative and enthusiastic about our opportunity. Phil’s brother made plans for their mom to stay with him and his wife. Our next door neighbors agreed to watch the dog and cat. We all had current passports, but needed travel visas. There are companies that handle travel visas for a fee, but this step can be easily handled directly through the Vietnam Embassy. A visit to the travel clinic determined that we needed typhoid vaccination, but fortunately not malaria or Japanese Encephalitis. Phil and Laura needed Hepatitis A vaccinations as well; I needed both Hepatitis A and B. Joseph was up to date on both. We learned as much as we could about cultural customs. For instance, we learned – among other things – that it is polite to use both hands when giving or receiving an item from another person, that one should never touch another person (even a child) on the head, not to be insulted if asked about our age, and that it is a great compliment to be offered the head of a chicken at dinner. When word got out that we were planning a visit, we received requests to bring along a few Christmas gifts for people that Hanna worked with. We were happy to help. 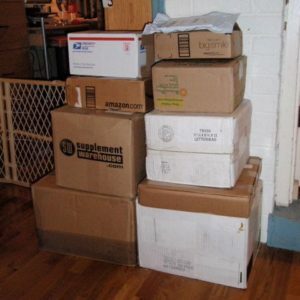 Then the packages started coming and kept coming. And coming. And coming. When it was obvious that we would need more luggage space, I went shopping for big suitcases. Sticker shock quickly led me to thrift stores. Upon hearing the reason why I was shopping, a kindly Salvation Army clerk insisted that suitcases were half price, that day only. I scored two jumbo suitcases for $5.00 – for both, not each. Three months passed quickly and early in the morning of December 22 we packed our ten suitcases and Grandma H in the van and drove to Kansas City to begin our Vietnam Vacation. My next few web log posts will address various aspects of our trip there, from travel to food and shopping to housing and infrastructure and more. I hope you’ll come along!